As you’ve probably heard from your dentist during your cleanings (or in another one of these blogs! ), having good oral health is essential to having good whole body health. We tend to think of this correlation as a preventative measure rather than one that can dial back health issues you already have, but for the 1 in 3 Americans who already have high blood pressure, we may have some good news. New research presented at the American Heart Association’s Scientific Sessions 2017 suggests that intensive treatment for gum disease can actually lower high blood pressure! 107 Chinese men and women with high blood pressure and moderate to severe gum disease received either standard or intensive periodontal treatment. In the patients who received the intensive treatment, their blood pressure dropped significantly over the subsequent months, with systolic blood pressure down by 13 points, and diastolic blood pressure down 10 points after six months. Of course, this research is fairly new, and periodontal treatment isn’t a cure-all for cardiovascular issues. However, if you have gum disease in addition to high blood pressure, scheduling a visit for some periodontal care certainly can’t hurt! Your baby is growing up, and so are their teeth! According to the American Dental Association most babies develop their first tooth around six months of age. After that first eruption your baby will have a full set of primary teeth in three years. Although it is usually pretty easy to spot teething, we created a list of some common signs of teething. If your baby exhibits any of these signs along with irritability and excessive drooling, then get out your teething tools and even ask your dentist or doctor about what you can do to help your teething toddler. Is your little one not falling asleep as easily as they used to? If so, teething could be the problem. As the teeth begin to come in your child will experience pain, which makes it more difficult for them to fall asleep and stay asleep. Teething toddlers will wake up more often due to the gum discomfort and pain that they feel. If your tiny tyke can’t seem to keep things out of their mouth, then they could be developing teeth. Oftentimes babies bite and gnaw on things to help relieve the pressure from their gums. Instead of hiding every toy, try a teething ring to keep your toddler happy. If your child is pulling at their ear or cheek, it could mean a couple of different things. It could be a sign of an ear infection, or it could mean teething. When teeth erupt they can cause pain that spreads across the cheeks and ears. If this happens, a trip to the doctor may be needed to rule out an ear infection. When teething begins, a child experiences sore and tender gums. The pain that they feel typically makes them refuse food. Try softer foods to help your baby get nutrients while their teeth transition in. Make sure to take good care of your child’s teeth and mouth even before the eruption of the first tooth. After teeth begin to develop, make sure to schedule a dentist’s appointment to make sure that everything is going well in your child’s mouth. As the body ages it becomes increasingly important to pay close attention to your oral hygiene. Keeping up with your dental health wards off common issues such as cavities and plaque. More important than this however, maintaining good hygiene limits your risk for gum disease and oral cancer. A study from Case Western Reserve University states that the “fatty acids from bacteria present in gum disease may cause Kaposi’s Sarcoma (KS)-related lesions and tumors in the mouth.” The study suggests the “byproducts of fatty acids” caused these oral tumors. As are the results with many forms of cancer, the research proposes pre-screenings of people with periodontal disease to catch tumors before the situation worsens. People with periodontal disease are known to have high levels of bacteria present in their mouth’s saliva, which can exacerbate the situation. When the research group was examined, people wanted to find out why some were developing these cancerous tumors, but also why those were not and what separates them from each other. This specific research concluded “the fatty acids impacted the replication of KS.” With fatty acids present, the body could not prevent the growth of the cancer. To ensure that you are not at high-risk for oral cancer as you age, make sure to not let your regular oral hygiene fall by the wayside. It’s also important to regularly schedule appointments at your local dentist’s office. If you already have periodontal disease, make sure you follow the treatment plans outlined by your dentist. You may not realize it, but your mouth is probably trying to tell you something pretty serious after you turn thirty. Past the age of thirty you have a fifty percent chance of suffering from some form of gum disease. If you are experiencing chronic bad breath, bleeding gums while brushing, bleeding or sore gums while flossing, discolored gums, or gums that are moving away from your teeth, then your mouth is telling you that you have gum disease. Be watchful for these signs of periodontal disease. Should you notice them, don’t wait too long to address the problems. If you see theses signs then you should call your dentist to book an appointment today. Ways that you can stop the progression of gum disease is by sticking to a healthy diet, using a mouthwash with fluoride, and chewing sugarless gum. Chewing gum will help increase the amount of saliva in your mouth and wash away bacteria. These tips will help prevent gum disease so that you will not need further gum restoration and treatment. Talk to your dentist to see if you are at risk for gum disease and for more information on how to prevent it. If you’re between 40-60 years old, you have unique concerns with regards to your oral health. Here’s what you should be paying attention to. Gingivitis is the first and only stage of gum disease that is reversible. If not treated properly, gingivitis can develop into periodontitis—a serious, destructive disease. Some people with gum disease show no visible signs until the damage has been done, which is why regular dental visits are crucial. Brushing properly and eating well is important as well. Many adults have missing or decayed teeth, which is detrimental to oral health! If you have gaps between your teeth, it can affect how you speak and eat. Missing teeth can affect proper chewing, cause the other teeth to shift, and sometimes even bone loss can occur. Here at Flawless Dental we offer several solutions for missing teeth. Do hot or cold foods make you wince? This could be a sign of increased dental sensitivity. This could be because of cavities, fractured teeth, improper fillings, gum disease, enamel problems, or an exposed tooth root. All of these can be treated. There are desensitizing toothpaste options and other alternative treatments your dentist can suggest after determining the cause of your sensitivity. Saliva is essential for oral health. Did you know saliva has enzymes that protect against cavities? If you have dry mouth, it’s a problem that should be addressed. There are ways to treat dry mouth! Oral cancer can happen in any area of the mouth cavity: lips, gums, cheeks, tongue, jaw, palate, and throat included. It usually appears as a small, almost unnoticeable spot or sore. Your dentist can check for any signs of cancer and discuss your health history. Many times suspicious changes will be unnoticeable to you, which is why a health care professional should check up your mouth regularly. Some symptoms of oral cancer are sores that bleed/don’t heal, a hard spot/lump, a roughened area, numbness in an area, tenderness in an area, or a change in the way your teeth feel when you bite. Tell your dentist or schedule an appointment if you have any problems with chewing, swallowing, speaking, or moving any part of your mouth/jaw. Cavities don’t stop when you grow up– they’re something that need to be prevented actively throughout your lifetime. Always brush your teeth twice a day and floss at least once a day, and make sure to schedule regular appointments with your local dentist! Where these tools are excellent alternatives to flossing, most dentists would agree that traditional flossing is still the best way to prevent tooth decay. However, these gadgets can help you at least get closer to the ultimate goal of flossing every day! If you suffer from osteoporosis, then it is important to let your doctor know about any medications that you may take. Many osteoporosis medicines (called antiresorptive agents) strive to strengthen bones, but can cause a rare condition to form. Some patients who take an antiresorptive medicine can develop osteonecrosis, which is a rare condition that can cause severe damage to the jawbone. It is most common to develop osteonecrosis after a dental procedure or surgery, which is why it is important to share your medication list with your doctor before you opt for a procedure. Knowing your medication list and your medical history may lead your dentist to choose a different treatment plan, or another procedure. Diet Soda = Dental Damage! Between the crack of the bottle cap, the bubbly fizz, the first refreshing sip, and zero calories to boot, diet soda can be totally addicting. But is it possible to enjoy this treat without any side effects? A new study states that diet soda could indeed be as “damaging to teeth as methamphetamine, or cocaine.” When examining both effects in the human mouth, it is seen to deteriorate and damage teeth just the same. We are concerned about our weight, so we switched to the no calorie diet soda, but it is so highly acidic that it can cause severe tooth erosion and oral damage! This specific study examined two males (one a 29-year-old meth addict, the other a 51-year-old cocaine addict) and one female (a 30-year-old diet soda addict) none of whom had been to the dentist in years. The goal of the study was to find out exactly what the link is between hard drugs and diet soda in relation to its effect on their individual oral health. Both the drug users and the soda addict were found to have rotting teeth and decay, and the younger man (meth user) suffered severe dry mouth from the drugs. The teeth were soft and discolored. 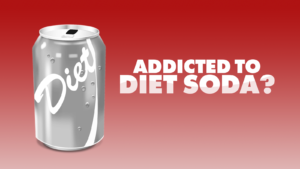 It’s scary to think that a diet soda addiction could be comparable to a drug addiction, at least in terms of our teeth!